Connect your USB On-the-Go capable tablet computer or Smartphone to USB 2.0 devices (thumb drives, USB mouse or keyboard, etc.). The UUSBOTG Micro USB On-The-Go (OTG) Adapter Cable features a Micro USB male (B-type) connector and a USB female (A-type) connector, delivering a simple way to convert your Micro USB OTG capable tablet computer or Smartphone into a USB On-the-go host, and enables you to connect a USB peripheral device such as a thumb drive, or USB mouse or keyboard, etc.This USB to Micro USB Host OTG cable is designed and constructed for maximum durability, to ensure dependable, long-lasting connections.This adapter will only work with devices that support USB OTG. Please consult your documentation and/or your service provider to ensure that your device does support USB OTG functionality. The UUSBOTG Micro USB On-The-Go (OTG) Adapter Cable features a Micro USB male (B-type) connector and a USB female (A-type) connector, delivering a simple way to convert your Micro USB OTG capable tablet computer or Smartphone into a USB On-the-go host, and enables you to connect a USB peripheral device such as a thumb drive, or USB mouse or keyboard, etc. This USB to Micro USB Host OTG cable is designed and constructed for maximum durability to ensure dependable, long-lasting connections. 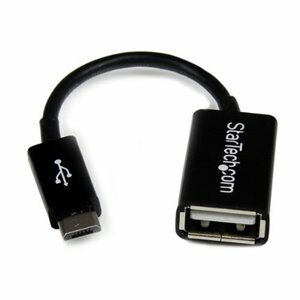 Converts your Micro USB OTG capable tablet computer or smartphone into a USB host for connecting USB accessories, enabling you to download pictures, transfer data, and work more efficiently. The USB port added by the adapter is situated approximately five inches away from your mobile digital device, offering more flexibility for connecting USB devices.